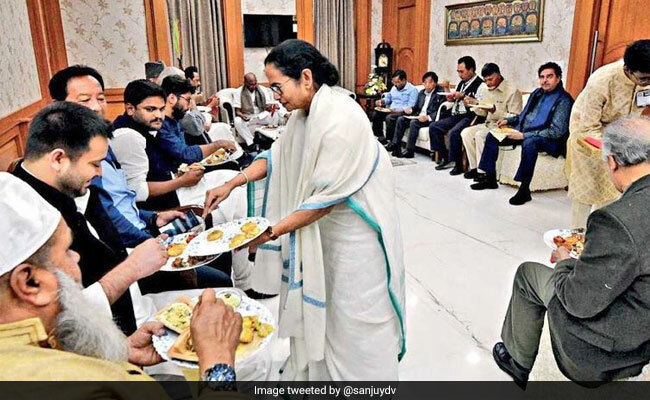 Mamata Banerjee is seen serving food to opposition leaders who attended her mega unity rally on Saturday, in a photo that has been widely shared over the weekend. The Bengal Chief Minister's "United India" rally at Brigade Ground in Kolkata drew 23 opposition leaders including from parties like the Congress, Samajwadi Party, Bahujan Samaj Party, Rashtriya Janata Dal, DMK and Aam Aadmi Party. 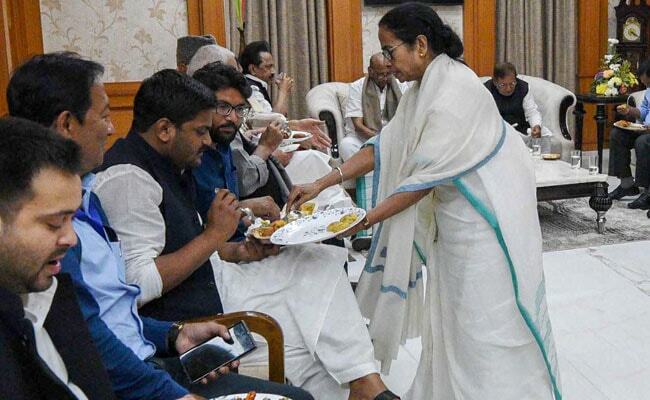 In the photo, Ms Banerjee is seen serving RJD's Tejashwi Yadav in a large room where all the leaders who attended the event are seen having lunch. The photo was tweeted by Sanjay Yadav, who describes himself as "political adviser to Ex Deputy Chief Minister, Bihar, Tejashwi Yadav". In another version posted on social media, the Chief Minister is seen serving Hardik Patel, the Gujarat Patidar quota activist. There was much praise for Ms Banerjee's famous "humility and simplicity" in posts reacting to the photos. But Ms Banerjee and the opposition leaders were not spared biting criticism and mockery. Former prime minister HD Deve Gowda, Nationalist Congress Party president Sharad Pawar, Samajwadi Party chief Akhilesh Yadav, National Conference chairman Farooq Abdullah, socialist leader Sharad Yadav, AAP's Arvind Kejriwal and DMK leader MK Stalin attended the event. Former ministers Yashwant Sinha, Arun Shourie and dissident BJP parliamentarian Shatrughan Sinha were also present. Rahul Gandhi and Sonia Gandhi did not attend but sent Mallikarjun Kharge and Abhishek Manu Singhvi to represent the Congress. Setting the tone for the national election due by May, opposition parties at the rally declared they would fight unitedly to oust Prime Minister Narendra Modi and the BJP which, they said, was "past its expiry date".